NOTE: This content is old - Published: Sunday, May 24th, 2015. The Daily Post have suffered a 10% year on year drop in print circulation, and the Leader dropped 12%. There also been an ominous prediction made on BBC’s Newsnight to the future of Trinity Mirror regionals. The latest ABC figures were released earlier this month including the Daily Post Wales, Trinity Mirror’s regional paper that has an east and west edition, with the east covering Wrexham. 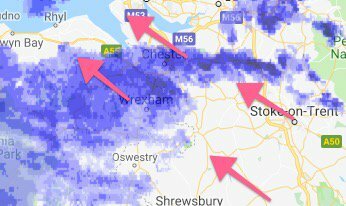 The ABC PDF certificate reads a total 24,827 circulation of the print edition, split between the 16,858 copies for the ‘west’, and just 7,969 for the ‘east’ edition that is sold in Wrexham – the first time that we are aware it has dipped under the 8,000 mark with JICREG indicating local daily sales in Wrexham are 1251 for Wrexham and 1589 for Wrexham Rural. 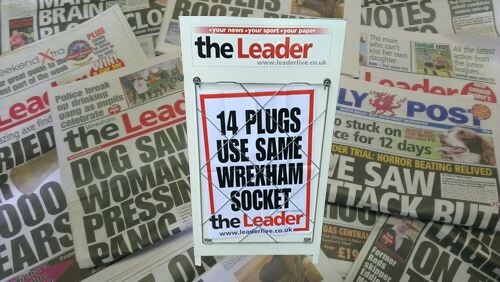 When we did our first round up of the ABC’s back in 2012 the Leader was selling 9,131 copies in Wrexham and the Daily Post east was selling 10,505. It is not possible to state the Leader’s figures from the ABC as they are no longer registered – however they do refer to JICREG stats themselves in advertising promotions so we will use those for reference. The JICREG numbers state they are ‘modelled’ rather than ‘actual’, and show a circulation of 2,661 in Wrexham and 2,005 in Wrexham Rural as of April 1st 2015 for the daily Leader. Year on year that is a drop of 12% for Wrexham (2014: 3023) and a drop of 12% for Wrexham Rural (2014: 2279). 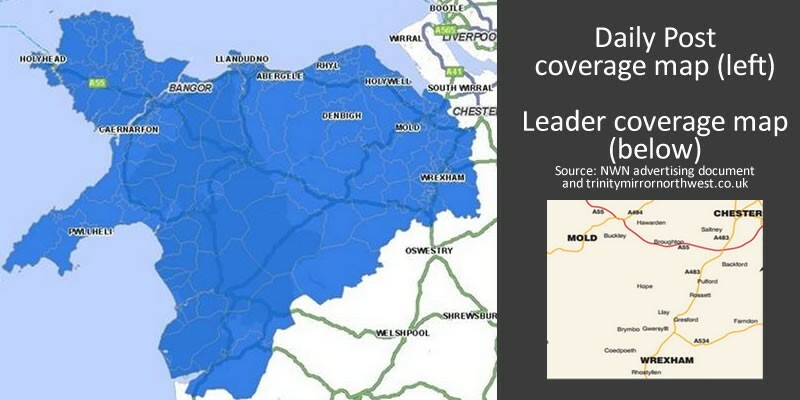 Although there is no geographic definitions online, the DailyPost.co.uk consistently covers the entire of North Wales pulling in some Liverpool and national coverage with its Mirror links, the LeaderLive.co.uk content appearing more Flintshire and Chester rather than Wrexham specific. Wrexham.com oddly enough covers Wrexham and relevant surrounding areas. The ABC stats now include the digital figures, showing the DailyPost.co.uk site gets 6.2 million pageviews a month. This allows a comparison with LeaderLive.co.uk and of course Wrexham.com. Helpfully the NWN ad document gives a ‘competitor comparison’, sadly only against the Daily Post print edition, where the bar graph is in favour of the Leader. We have used the common although not entirely useful metric of pageviews to compare all NWN titles mentioned (Source NWN’s ‘latest monthly statistics for each website’ from Google Analytics), the Daily Post from the ABC online stats and our own stats independently from Google Analytics for the last 30 days at the time of writing. 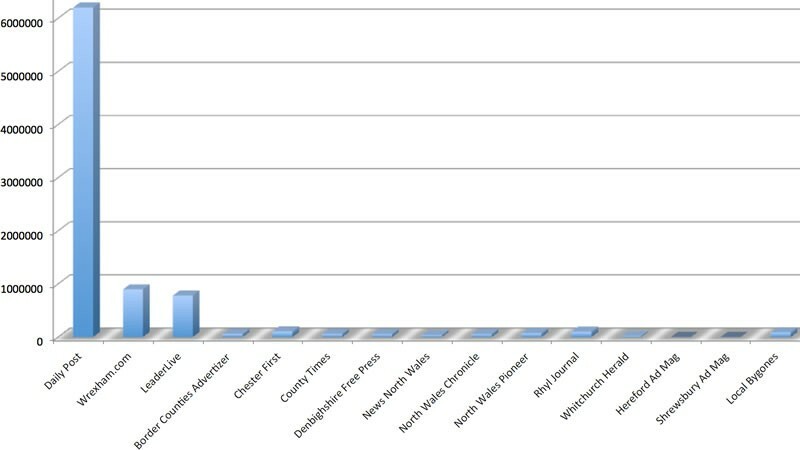 Using public information over the last 30 days it is possible to give a rough comparison on the online output of the titles, with the Daily Post around 130 new articles, the Leader pushing out around 70 and Wrexham.com around 20 a week. As above the geographic relevance of the content varies depending on what is going on in the various areas each title covers. Due to the closed nature of useful statistics it is not possible to have precise comparisons of outputs, however Facebook does allow some guide data in terms of posts, which when compared to public data gives an very rough indicators. With that proviso, Wrexham.com outputs roughly 15% of the posts of DailyPost.co.uk, and gets near enough 15% of the pageviews of the Daily Post. LeaderLive create 54% of the posts of the Daily Post but only gets 12% of their pageviews. 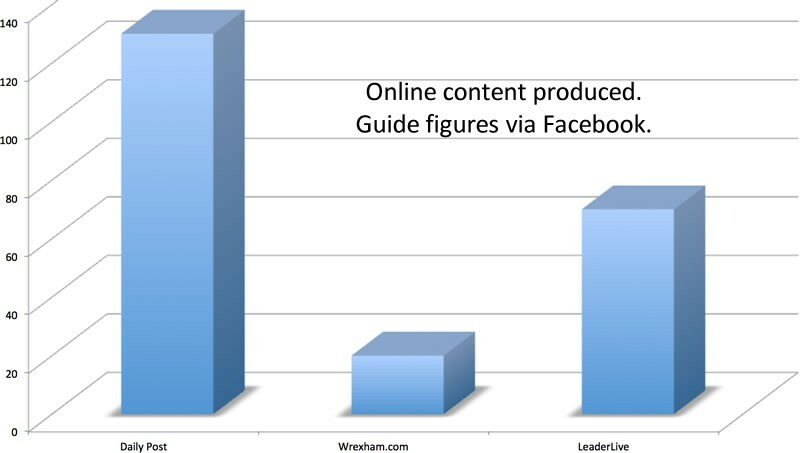 Comparing more locally, Wrexham.com pushes 28% of the amount of posts LeaderLive does, but gets 115% of the pageviews. Of course Wrexham.com will blow its own trumpet in terms of punching above our weight, not only in terms of the reach of our output but also in terms of resources used to achieved it and subsequent engagement. We see it as a huge compliment to our work that our social media engagement is being increasingly jumped on and followed up not just by ourselves, but but other titles. Such work is now part of formal job descriptions at Trinity Mirror and elsewhere – so if you love Wrexham.com’s twitter, you can be paid to read it (apply here!). The ‘digital first’ push could be an issue for the Daily Post where its print strength is to the West of North Wales, with news from the latest Office of National Statistics figures stating the fact 41% of people in Anglesey haven’t used internet in last 3 months – perhaps a firm example of a future ‘digital divide’ and why print is still very important for those communities. One further possible issue on the horizon for the Daily Post and other Trinity Mirror regional titles is the fall out from the national phone hacking scandals. Last week a judge awarded privacy damages payouts of £1.2m to eight victims with Trinity Mirror increasing its estimated costs for dealing with phone-hacking from £12m to £28m, but with ‘Hacked Off’ group stating they believed it will rise much higher. Thursday’s BBC’s flagship ‘Newsnight’ programme ran an interview with a former Mirror journalist convicted of phone hacking. In the interview Graham Johnson was asked about his thoughts on the impact of the phone hacking. Referring to ‘hundreds’ of claims ‘in the pipeline’, Mr Johnson said the overall costs to Trinity Mirror could mean ‘journalists being made redundant’ and ‘lots of the regional titles will be affected because there wont be any money’. Aside from this Trinity Mirror have already closed 18 regional titles in the past six months, although the Chief Executive has said there are no immediate plans for further closures if titles stay profitable. Wrexham.com is obviously proud of what we do and the competitiveness we achieve on such low resources, but we take no joy in documenting what appears to be the slow retreat of genuine local information and debate. As a recent example it is quite scary that dull yet important stories on the future political balance of the local council could be played down for something more trivial. Fun stories and features are great, however if the viability of a title is defined by an almost irrelevant metric on a remote beancounters spreadsheet we cant help but feel local issues, and the arena to debate those issues could well be lost or diluted to irrelevance. Read 1,162,621 times in last 30 days, and 73,989,393 times since we started in 2011.